Carnivores are predators and chiefly eat meat, although some will consume plants. They will drink water when it is available, but are not dependent on it since the moisture-rich flesh of their prey satisfies their water needs. 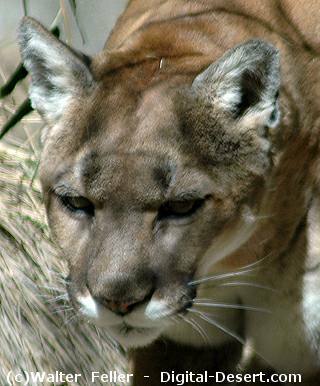 This group includes such well known members as the coyote, kit fox, gray fox, bobcat and mountain lion. A member of the dog family, the coyote resembles its domestic cousins except that its nose is more pointed and its tail is bushier. The coyote is a very vocal mammal, communicating through barks and howls. Its scientific name, Canis latrans, literally means 'barking dog." In addition to being a predator, the coyote is an omnivore (plant and animal eater) and a scavenger. This varied diet allows the coyote to exist under the desert's harsh conditions and is one reason why the coyote is now the most widespread mammal in the United States. It can be seen occasionally from the scenic loop drive. The gray fox also has a varied diet, but not to the extent of the coyote. It hunts widely at night, subsisting on rodents, ground squirrels, birds, wild fruit, insects, amphibians and small reptiles. It is an adept climber and will often search for food or escape danger by climbing trees. Weighing only five pounds, the kit fox is the smallest dog in the United States. It survives by being nocturnal and sleeping in the shade of a tree or in its den during the hot part of the day. Its large ears and sharp sense of smell help it to catch prey. Usually the kit fox seeks kangaroo rats, but lizards, insects, birds and rabbits will also be eaten. Watch for this elusive creature alongside the road as you drive through the desert at night. The bobcat, the most abundant cat in the southwestern United States, also resides in the area. It spends most of the day under bushes, usually in rock fractures or canyons. The bobcat has little endurance and stalks prey rather than chasing it. It primarily eats rodents, but will take rabbits, ground-nesting birds, and occasionally, a young deer. Because of its nocturnal nature, it is not often seen unless disturbed from its daytime resting place.